A Victorian ‘pool’ structure hidden within the fishpond of Ham Manor in Llantwit Major, Wales was discovered during a restoration of the gardens. Historians have been left baffled after the discovery of a rare Victorian ‘pool’ hidden beneath a fish pond. 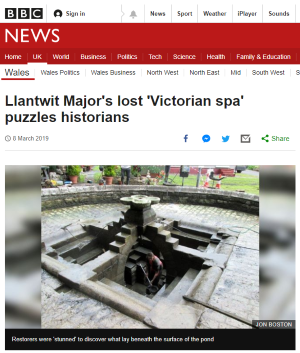 Restoration work in the gardens of 150-year-old Ham Manor in Llantwit Major, Vale of Glamorgan, revealed the long-forgotten secret. Thought to be a wallowing pool, it was only discovered when water was drained from the historic ornamental pond. However, some local historians admit they are ‘puzzled’…. The pond had remained largely undisturbed since the manor house, designed by the prominent architect Sir Matthew Digby Wyatt, was built in 1869. But when restoration began, workers were ‘amazed’ to discover what lay in the centre. Local archivist and chairman of Llantwit Major History Society said it was a ‘peculiar’ find.